EOD team members unload the naval shell from their vehicle after having transported it to the Central Demolition Site for destruction. Trung Son, Gio Linh (15 March 2016) – When the waters of the Ben Hai River have gone down after heavy rains, Vo Huu Tuong from Kinh Thi Village has taken the opportunity to spend a couple of hours wading out and collecting wood and drying it for cooking. On such a day in early March, he was surprised to encounter a deadly wartime munition. That day, after he tried but failed to lift an extraordinarily heavy “log” out of the water, Tuong was shocked to realize that he just attempted to move a piece of unexploded ordnance (UXO). Too frightened to continue, Tuong waded back to the bank of the river and returned home. Two days later at the village community center, the 60-year-old villager met a Project RENEW Non-Technical Surveyor, Nguyen Van Thuy, who was there interviewing local villagers for UXO-related information. Tuong related his shocking discovery to Surveyor Thuy who took notes that he quickly passed on to a Project RENEW EOD team. 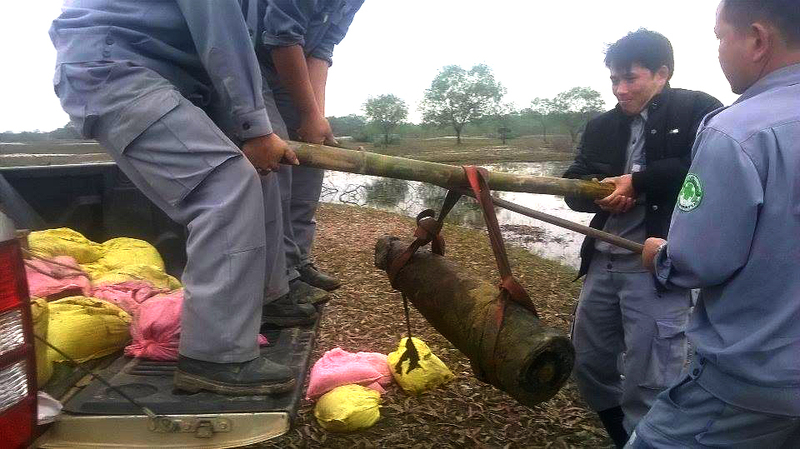 Following Thuy’s instructions, the EOD team went to the river site and found the munition under the water. It was an 8-inch naval shell fired from a U.S. ship during the war more than 40 years ago. The team removed it from the river bed and transported it to RENEW’s Central Demolition Site for later destruction. RENEW’s Non-Technical Surveyors spend most of their time meeting and talking with local people at their workplace to collect UXO-related information. Surveyor Ho Sy Khuong is talking with a herdsman in Gio Binh Commune, Gio Linh District. 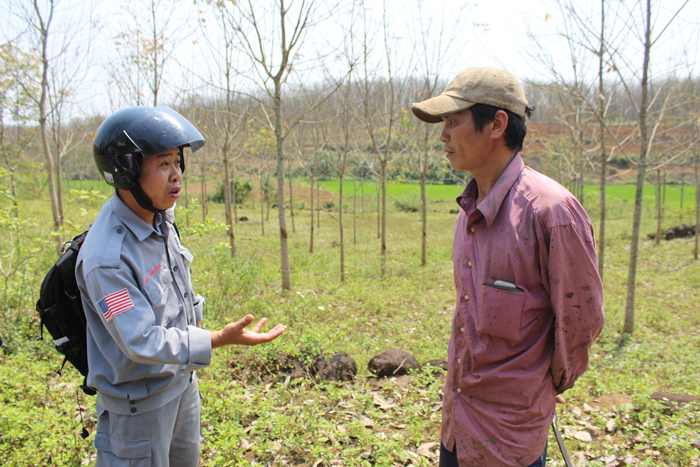 Nguyen Duc Hoa, RENEW’s Non-Technical Survey (NTS) Team Leader, said that information from local people in Gio Linh District during the past two weeks had led his team members to determine that 10 areas were suspected to be contaminated with cluster munitions. Those areas are being followed up with technical survey, which will provide much more precise information, and clearance if necessary. Experience has taught RENEW teams that clearance is often a follow-up requirement. Straddling the former Demilitarized Zone (DMZ) and once the location of several U.S. Marine Corps bases such as Con Thien, Gio Linh District was the site of fierce ground fighting and bombardment during 1967 and 1968. Gio Linh District has just been added to Project RENEW’s operations, as of March 2016, as part of province-wide expansion funded by the U.S. Department of State. NTS operations are the first step, aimed at providing evidence of whether further interventions are needed. The new expansion follows Project RENEW’s successful work in partnership with Norwegian People’s Aid (NPA) in two other districts, Trieu Phong and Cam Lo, where RENEW and NPA introduced a unique and more efficient approach to systematically cleaning up UXO. The NTS teams conduct desk studies and village meetings and collect valuable information from local residents that lead to exact sites of dangerous ordnance. This “evidence-based” approach is then followed by sweeps of the area using a tested methodology that is specific to cluster bombs strikes. A pattern or “footprint” is determined quickly and followed by cleanup of the ordnance found and, ultimately, when all ordnance in the area has been destroyed, the team informs local residents that the area is now safe for normal activities. In June 2015, an artillery shell explosion killed a 42-year-old man, father of three children, in Kinh Te Moi Village in the same commune.